What is your favorite salad? I would have to say I have 3 favorites…..steak and blue….chicken and pear….and Asian chicken salad. Don’t you feel like you’re being healthy when you have a salad? Even if it’s loaded with candied walnuts, cranberries, blue cheese…..hahahhaha. Ok, well a salad like that isn’t exactly healthy. I never have those kind…..ever. Only once. Maybe a few times….ok, today. But I didn’t have the candied walnuts. I was out of those. Ok, so whatever salad you like, you need a tasty dressing, right? This is a simple one that you just shake up in a jar. You can use it as a base and add so many different things to it to change it up. 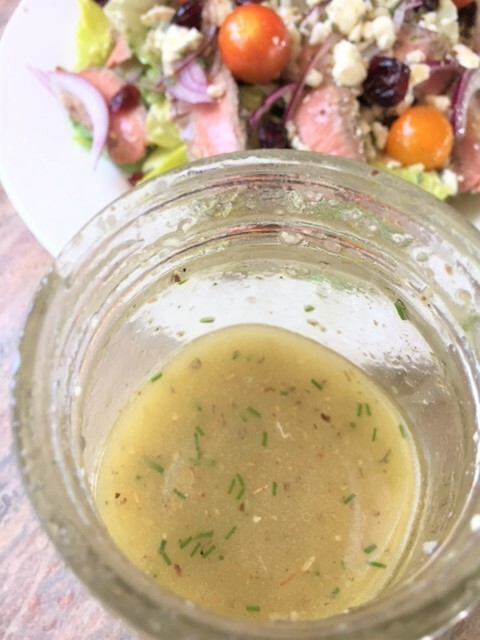 Not only is it good on a green salad or pasta salad, it also makes a great marinade for chicken and dipping sauce for bread! So, check out my salad . Doesn’t it look healthy? 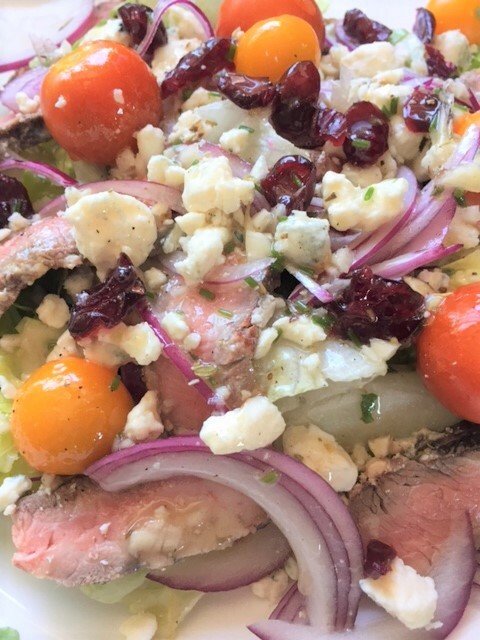 Focus on the greens…not on the blue cheese. Don’t you feel healthy already? Put everything in a jar. Shake it up. Store in the refrigerator. 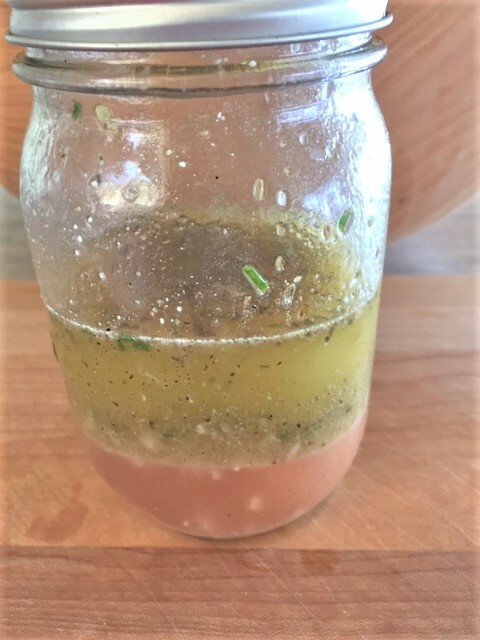 – If using as a chicken marinade, just pour it over chicken and allow to marinate for at least 4 hours. 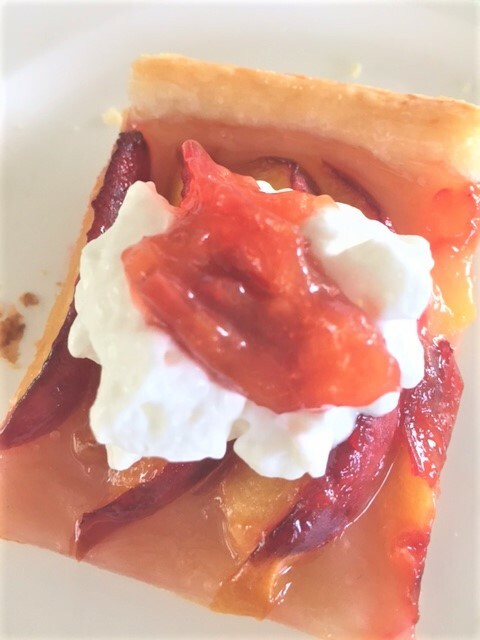 Super Simple 3 ingredient Peach Tart…………. I’m so happy that so far, the peaches seem to be good this season. Last year’s peaches sucked! 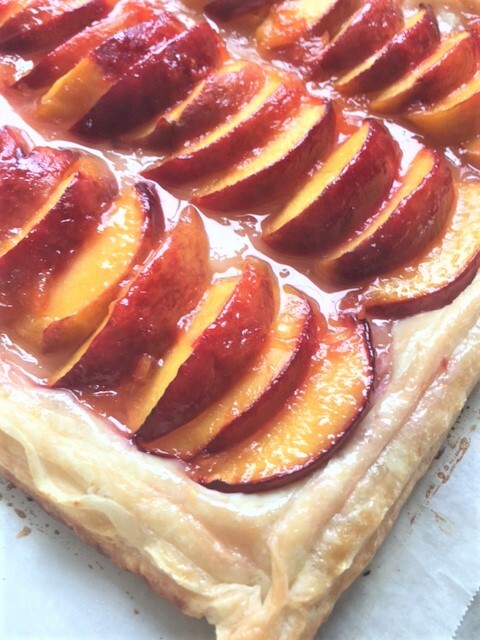 I have a long list of “must make peachy things” and I started with this super yummy, beautiful, easy peach tart! It’s only 3 ingredients!! Seriously! Aren’t you excited? I didn’t peel my peaches for this, because I wanted it to be extra purty, with that beautiful red color. But the next time, I will either cut up the peaches or remove the peels altogether. They get a bit chewy..just a wee bit. But I like the bit of tart it gives the peaches. So, you decide what you wanna do. This is best eaten within an hour of making it. That way, the puff pastry will still have some crisp. But this is so good even when its soft….cold or room temp. Heat oven to 350. Line a baking sheet with parchment paper and place the pan in the oven to heat the pan. For the peach glaze, place the pieces of the one peach in a saucepan with the 1/4 cup sugar. 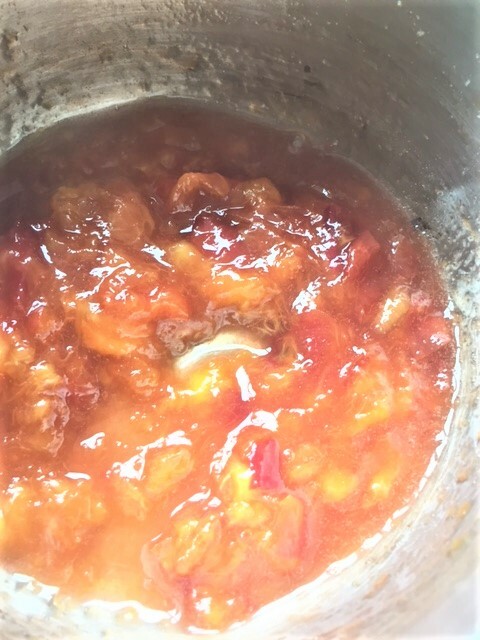 Heat until peaches are soft enough to smash up and mixture looks like a peach topping. Remove from heat and allow to cool a bit. Slice up the remaining 4 peaches. Remove the hot baking sheet from the oven. 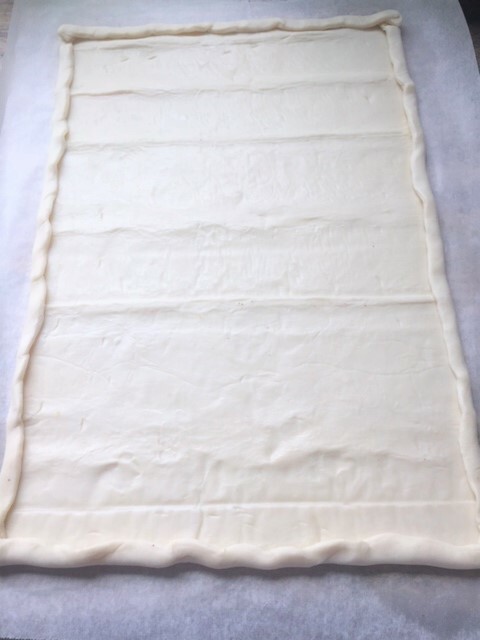 Unroll the puff pastry and lay it out on the parchment lined baking sheet. Fold over the edges, just a bit, to form a crust as pictured above. 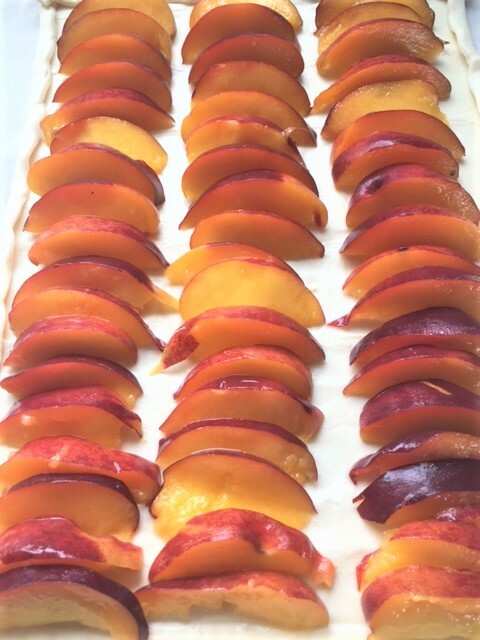 Place the sliced peaches on top of the pastry in any pattern you want. 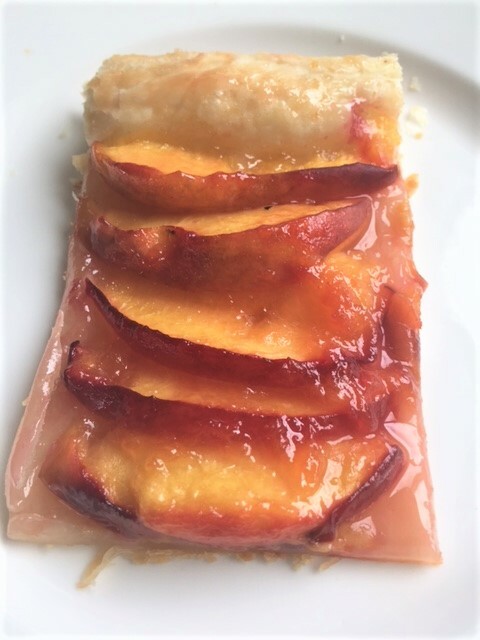 Brush with the peach glaze that you made. Brush some glaze on the crust edge, all around. Bake for 25 minutes. Crust should be golden brown. Serve as is, with ice cream or whip cream. Here is a great dish for the weekend! We all love chicken wings right? There is a restaurant here in town that serves several kinds of chicken wings. One of my favorites, is the Dirty Blue. Oh boy, oh boy, are they good! 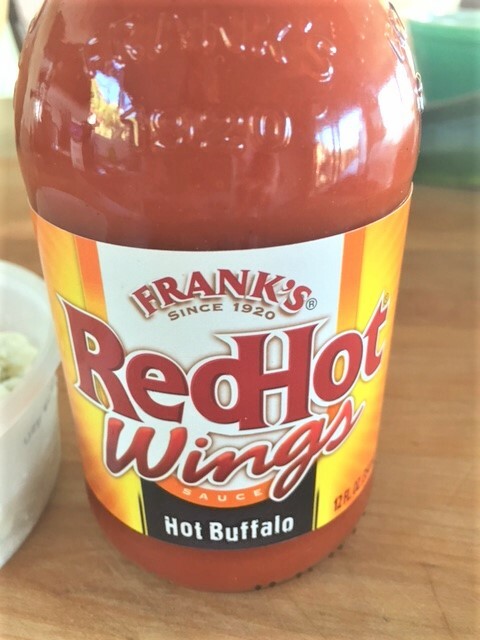 The wings are coated in a spicy wing sauce with a hint of blue cheese flavor. 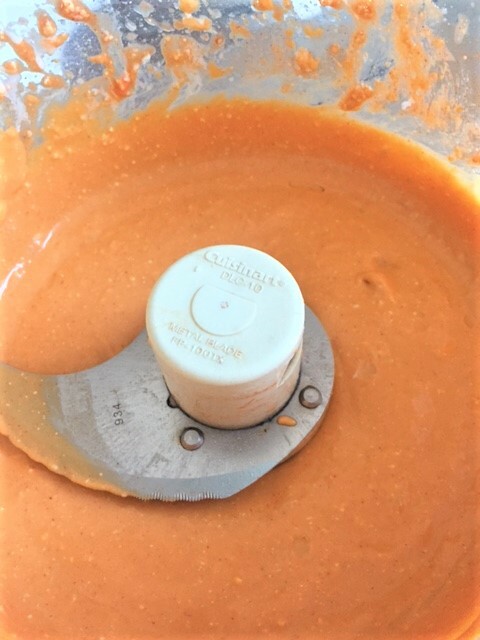 I just love them and decided to make my own sauce. Yes!!! I did it. I like mine way better. I don’t normally like the bottled wing sauces…too vinegary for me. But it works for these wings. Not only are they so good, they are super simple. 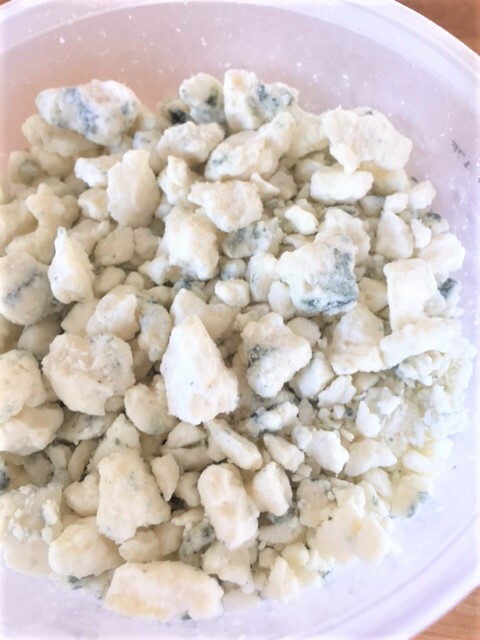 Now, if you are not a fan of blue cheese…….really? Hahaha, you could always substitute it with Ranch dressing. Those are so good too. Or, why not use Ranch dressing and throw in some blue cheese. Heat oven to 425. 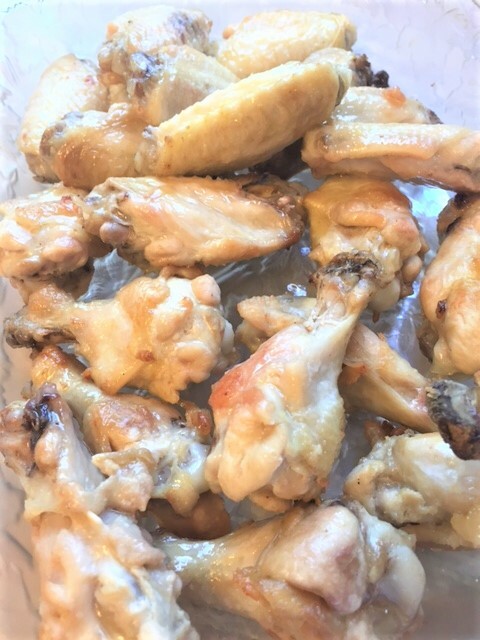 Place wings on a foil lined baking sheet. Bake chicken wings until they are thoroughly cooked, about 45 minutes. In the mean time, make the sauce. 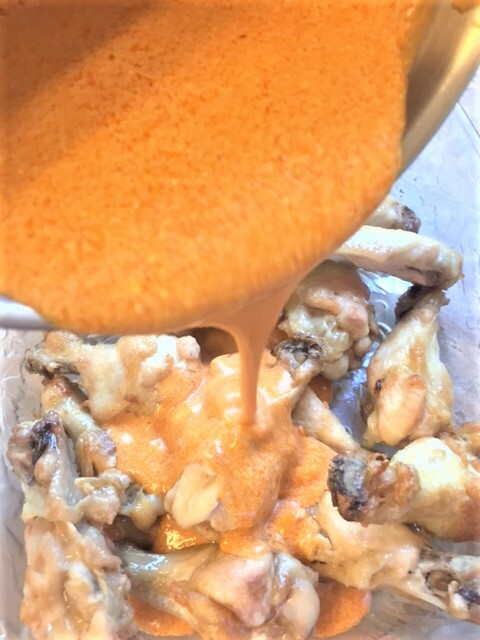 In a food processor or blender, mix together the wing sauce, blue cheese and milk. Blend until smooth. Pour into a sauce pan with the butter, over medium heat. Once heated through, turn heat down. 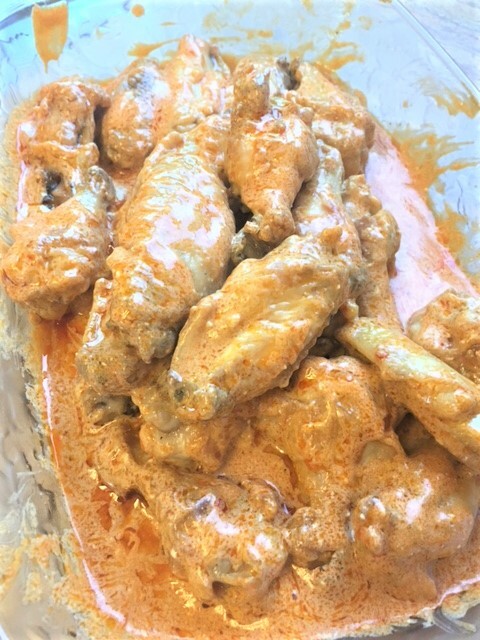 When wings are cooked, dump them into a bowl or deep dish and pour the sauce over them. Give them a toss to coat completely. Serve immediately. 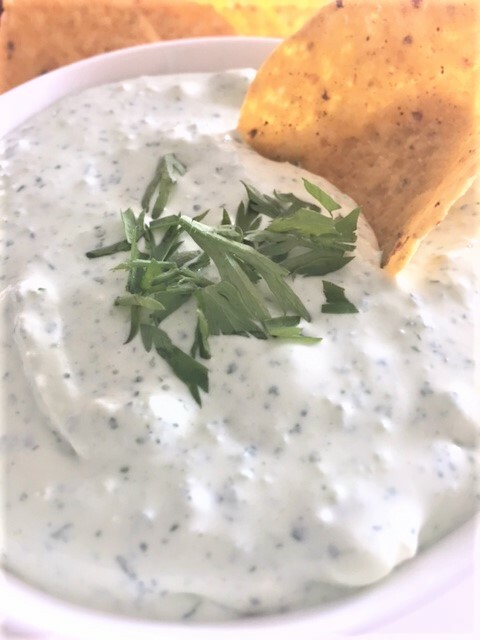 If you’re looking for a great dip to take to your next get together, or just to enjoy at home, here it is! 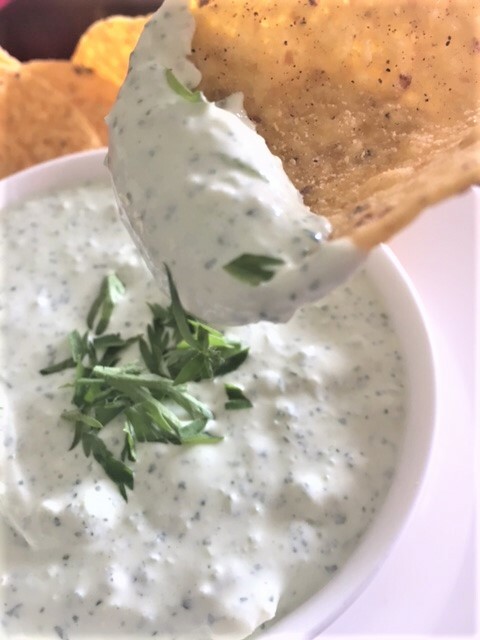 OMG, this is some delicious dip. It’s creamy, zesty, tangy and even though it has heat, you can’t stop eating it. If you are not a fan of spicy hot, then just cut down on the amount of jalapeno. I personally, like a lot of heat. So I used a serrano chile and a jalapeno. The serrano is a bit hotter than jalapeno. Grab a bag of tortilla chips and dip away! Oh, and this dip works with tacos or burritos too. Or, you could serve it with veggie sticks (boring) hahahah. Oh, and French fries or wedge fries. 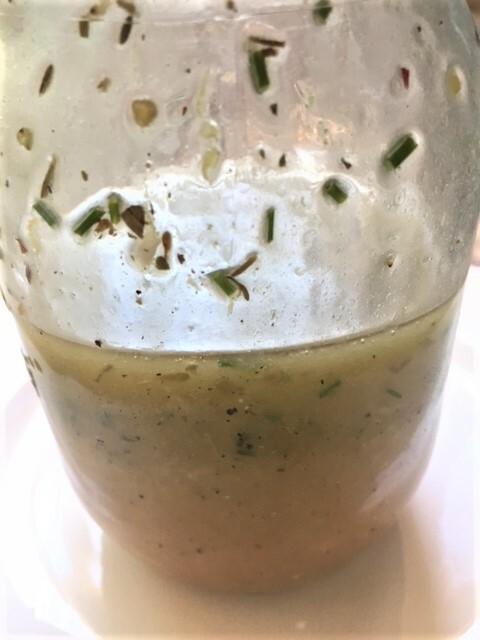 In a food processor, put the jalapenos, cilantro and garlic cloves. Pulse until it’s almost a paste. Add the cream cheese, sour cream and lime juice. Pulse until smooth and creamy. Salt to taste. Transfer to a bowl. Let it set for at least an hour and even longer if you can wait that long. The flavors will really come together the longer it sets.